A man alleged to have carried out armed robberies at a Warwick petrol station and a village store on the same night will not stand trial until July next year. Michael Hackett pleaded not guilty at Warwick Crown Court to two charges of robbery and two of possessing an imitation firearm at the time of committing the offences in June. It is alleged that Hackett (30) of Fallow Hill, Sydenham, Leamington, first robbed a cashier at the BP service station in Stratford Road, Warwick, at gunpoint. About half an hour later there was an identical robbery at the Co-op store in Long Itchington, again alleged to have been carried out by Hackett. Because of the number of trials waiting to be heard at the court, Judge Stephen Eyre QC pointed out that the trial could not be listed until July next year. He adjourned the case until then, and Hacket was granted bail, with a warning that if he fails to attend for his trial, he will be committing a further offence. 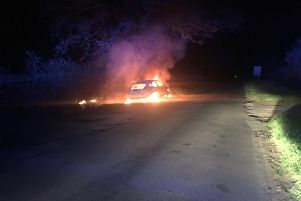 In the meantime, the get-away driver, Samuel Gold (30) of Freshwater Grove, Leamington, is likely to be sentenced, having been convicted of all four charges following a trial last month.